Ebay App – Get It Now! 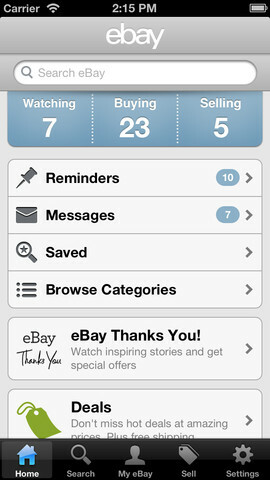 Tap into the world’s largest marketplace with the Official eBay for iPhone app! Now you can buy and sell items, compare prices, access our powerful search tools and so much more all from the palm of your hand. Make the eBay app work for you. Set up notifications and bid alerts to let you know when your item is ending, when you’ve been outbid, won or sold an item, received an offer, payment or message, and more! Saved searches and Saved sellers allow you to easily access your favorite items, members and stores with one quick tap. You can also share items with friends via email, SMS, Facebook & Twitter.